An account of the events leading to the Guildford 4 and Maguire 7 miscarriages of justice, adapted from Bob Woffinden’s 1987 book ‘Miscarriages of Justice’. Anti-Irish hysteria flared up across Britain in the aftermath of bombings in England in 1974 in Guildford, Woolwich and Birmingham, and quickly made itself felt in parliament. The British Home Secretary introduced the Prevention of Terrorism (Temporary Provisions) Bill within a week of the Birmingham bombings. The police were empowered to arrest without warrant anyone they reasonably suspected, but against whom they had not assembled sufficient evidence in regard to a specific offence. The Prevention of Terrorism Act (PTA), as it became, went through all its stages in the Commons in twenty hours, and passed unamended through the Lords in just three minutes. The first person arrested under the PTA, within hours of it receiving the Royal Assent, was Paul Hill. Belfast-born, he lived in a squat in Kilburn, north London, but was picked up at the home of the parents of his girlfriend, Gina Clarke. In court, police did not reveal what prompted their interest Hill. They simply said they were acting on ‘information received’. One theory of how Hill’s name came to their attention was that Identikit pictures of two girls whom police said they wished to interview were published in all national newspapers. One British army officer remarked that one of the identikits looked like Paul Hill in drag - and the Surrey police were informed. A friend of Hill’s from Belfast, Gerard Conlon, who had spent some time in England from August to October 1974, was arrested at the family home in Belfast, and taken to Springfield Road police barracks. From there he was flown to England and taken to Guildford police station. At Guildford, police placed Hill and Conlon under intense duress and obtained not only confessions to the Guildford bombings, but also a long list of friends, relatives and acquaintances supposedly involved in IRA activities. Conlon provided the crucial name of his aunt, Annie Maguire. A large number of people were then rounded up, including thirty-eight from Kilburn squats. Among these were Patrick Armstrong, another lad from Belfast, and his English girlfriend, Carole Richardson. They, together with Hill and Conlon, ultimately stood trial for the Guildford and Woolwich bombings. Hill and Conlon also provided addresses of what were supposed to be two bomb factories. Hill referred to visiting a Brixton flat, where explosives had been stacked in a corner. There the police discovered only an elderly couple, and decided not to pursue inquiries. The other address - was where Conlon’s aunt Annie Maguire lived, together with her husband, Paddy, three sons - Vincent, John and Patrick - her daughter, Anne-Marie, and her brother, Sean Smyth. On 3 December they were joined by Guiseppe Conlon, who was married to Paddy’s sister, Sarah. Conlon snr was born in Belfast in 1923, and christened Patrick Joseph. Because his godfather, Joe Roffe, was an Italian who owned a chip shop in Divis Street, “Guiseppe” was added to the birth certificate; and, presumably to distinguish him from everyone else christened Patrick Joseph, that is what they all called him. During the war Conlon served in the Royal Marines. By the seventies, however, he was very frail. For his various illnesses, which included pulmonary tuberculosis, he was prescribed twenty-six tablets a day. He had not worked for fifteen years, and rarely left his home. When his son Gerard was arrested and, protesting his innocence, flown to England, Guiseppe determined, despite his incapacity, to do all he could to help him. Through the offices of a Belfast solicitor, Ted Jones, a London firm of solicitors was contacted. A telegram was also sent to the Maguire household. Conlon and Jones arranged to meet at the offices of the solicitors on 3 December. 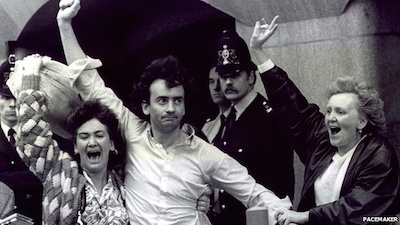 Jones was subsequently informed by Surrey police that no one would be allowed to see Gerry Conlon until later in the week. He consequently delayed his own trip - sending a second telegram to the Maguires, to inform Guiseppe. By then, however, Guiseppe was already on his way, having disregarded the advice of his doctor (Joe Hendron, who also happened to be a local SDLP councillor) that he was too ill to travel; and having informed the RUC of the purpose of his trip. He asked neighbours to drive him to the ferry and reached England the following morning. He exchanged a few words with an immigration officer, and then boarded the London train. He fell asleep on the journey, and arrived in London at about noon. Despite the telegram to Annie’s home, he had hoped to contact first of all another brother-in-law, Hugh Maguire. However, he failed to reach him by telephone, and accordingly took a taxi to Harlesden. When he arrived between 1.10 and 1.30 only Paddy was at home to receive him. As Guiseppe feared, Paddy immediately enticed him down to the local pub, the Royal Lancer. When they returned at closing-time, Annie showed Guiseppe the telegram informing him that he would be unable to see Gerry for a day or two. Then while Annie cooked a meal in the kitchen Paddy telephoned the London solicitors, and Guiseppe spoke to them. A meeting was fixed for the following day. For the remainder of the afternoon, Guiseppe hardly moved from the living-room. He just dozed in an armchair in front of the television. There were some comings and goings. Annie and Paddy, a warmhearted couple, were generous with their hospitality. Sean Tully, a friend of Hugh’s, made two separate visits, and just after 6.45 another friend, Pat O’Neill, arrived. His visit was entirely fortuitous; although, in the circumstances, the word should perhaps be “inopportune”. His wife, expecting their fourth child, had been admitted to hospital because of complications with the pregnancy. O’Neill had therefore asked her sister to take care of their three children while he was at work. However, his father-in-law was then taken seriously ill, and his sister-in-law had returned to Ireland. So he had collected his children from school and then gone to Annie’s because she had agreed to help him out and look after them for him. At 8 o’clock he spoke to his wife in hospital, no doubt reassuring her that all was well. At 8.15 he, Paddy, Guiseppe and Sean Smyth, who had lately returned from work, all went to the pub. The police officers keeping watch outside incorrectly noted the time of departure to the pub as a quarter to eight (7.45) instead of a quarter past eight (8.15). It was a simple error which had unforeseen consequences. The Maguires’ eldest son, Vincent, returned home from evening classes at a quarter to nine, and noticed a large number of police cars parked outside with their lights switched off. Moments after he had entered the house, the police rang the doorbell and were admitted without demur. Annie and her children were taken to Harrow Road police station. John Maguire showed two police officers the way to the pub. The four men were taken in for questioning from there, just as they were about to start the second round of drinks. They, too, offered no resistance. The task of rounding up the suspects had been carried out by Surrey CID. The chief constable of Surrey was apparently determined to show that his men could take responsibility for the whole operation. Indeed, when the Kilburn squatters were taken in, Surrey police carried their weapons into an area of metropolitan police jurisdiction without first receiving clearance to do so: a remarkable occurrence. As part of the wide seizure, Hugh Maguire, his wife and a friend had all been held for questioning; hence their absence when Guiseppe Conlon had tried to telephone them. They were all released after a week in custody. Friends of those netted in the raid on Annie Maguire’s home assumed theirs would be a similar fate. At a time of escalating antipathy towards those of Irish origin, seven dispiriting days in custody seemed almost par for the course. Subsequent events, however, were nothing if not unforeseen. Firstly, Pat O’Neill was released on the following day. a Wednesday. He renewed his search for someone to take in his children while his wife was in hospital. Having accomplished this successfully, he returned to work. Three days later, at 7.00 a.m. on Saturday morning, the police pounded on his door and rearrested him. The Maguire youngsters were released, but the others were taken to Guildford and held on remand there. (Annie was held at Godalming and Guildford police stations.) Their weekly court appearances, too, were made in Guildford, a city which none of the family had been to before. The four men were charged with possession of explosives. Annie Maguire was charged with murder in connection with the Guildford and Woolwich bombing offences. At that time, the police were holding eight people on that charge: the four who eventually stood trial; Annie; and John McGuiness, Brian Anderson and Paul Colman, three others from Kilburn. Annie did have an alibi for the evening when the Guildford bombs had exploded. By chance, 5 October happened to be the birthday of her neighbour’s daughter, two days before Anne-Marie’s. So, they could remember being together in the early evening. The police checked this alibi, and found that it was watertight. Because Annie also refused to allow herself to be cajoled or bullied into fallacious admissions, there wasn’t a scrap of admissible evidence against her, or, indeed, against McGuiness, Anderson or Colman either. On 3 February 1975, Michael Hill, for the Director of Public Prosecutions, told the Guildford court that it had been decided not to press further with charges against these three, who were all awarded costs out of public funds. Annie Maguire was held in custody on the murder indictment until 24 February when, on her thirteenth appearance before magistrates, the prosecution finally dropped the charge. Annie, however, was hardly in a position to celebrate. She was still remanded on a charge of possessing explosives; and two of her children, Vincent, sixteen, and Patrick, thirteen, were taken back into custody and similarly charged. They were both admitted to a juvenile remand home, which caused her great distress. On 19 March, Hill, Conlon, Armstrong and Carole Richardson were sent for trial; the following day, so were the seven defendants in the Maguire case. Annie remained in custody until 15 April when her solicitor finally obtained bail for her, to allow her to look after eight-year-old Anne-Marie. The trial of Paul Hill, Gerard Conlon, Patrick Armstrong and Carole Richardson opened at the Old Bailey on 16 September 1975 and lasted until 22 October. All four were found guilty of charges of murder and conspiracy to cause explosions relating to the Guildford bombings. Hill and Armstrong alone were indicted on counts of murder and conspiracy to cause explosions at Woolwich. Both were found guilty, although the Crown contended that Hill only was present at the scene; Armstrong was convicted on the grounds of being what would once have been called an “accessory before the fact”. He was at his most Draconian, however, when addressing Paul Hill: ‘In my view your crime is such that life imprisonment must mean life. If as an act of mercy you are ever to be released it could only be on account of great age or infirmity’. * After a long international campaign for justice, the Court of Appeal quashed the sentences of the Guildford Four in October 1989, and in June 1991 it overturned the sentences on the Maguire Seven.